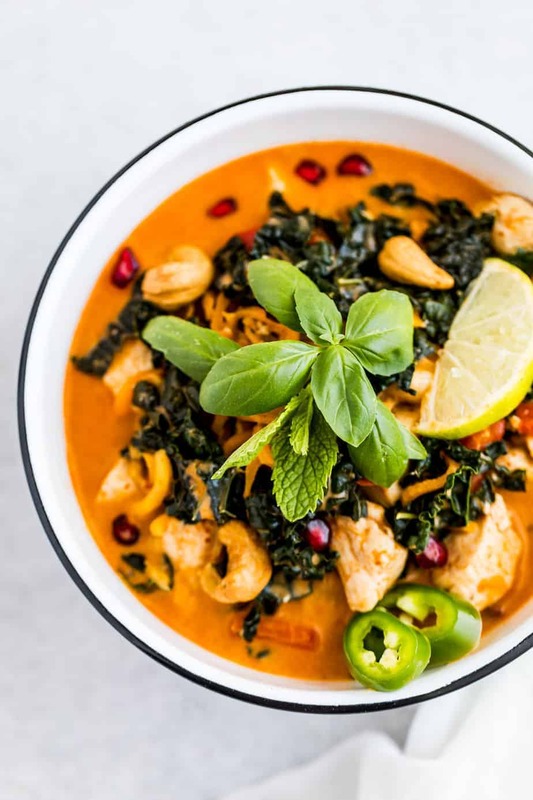 Thai Red Curry Chicken, made with flavorful red curry paste and healthy autumn ingredients: butternut squash, and kale, with fresh pomegranate and cashews to add texture in the curry soup. served with fresh pomegranate and cashews. An easy Thai soup recipe that can be prepared in 30 minutes! This harvest curry with butternut squash noodle is perfect to warm up your fall or winter. The season of Fall is here! I get excited for the cooler weather, and also for the opportunity to cook with fresh fall produce. Butternut squash, sweet potato, Brussels sprouts, cauliflower, beet roots, brocolli, kale, winter squash and mushrooms are just some of the veggies that thrive most this time of year. 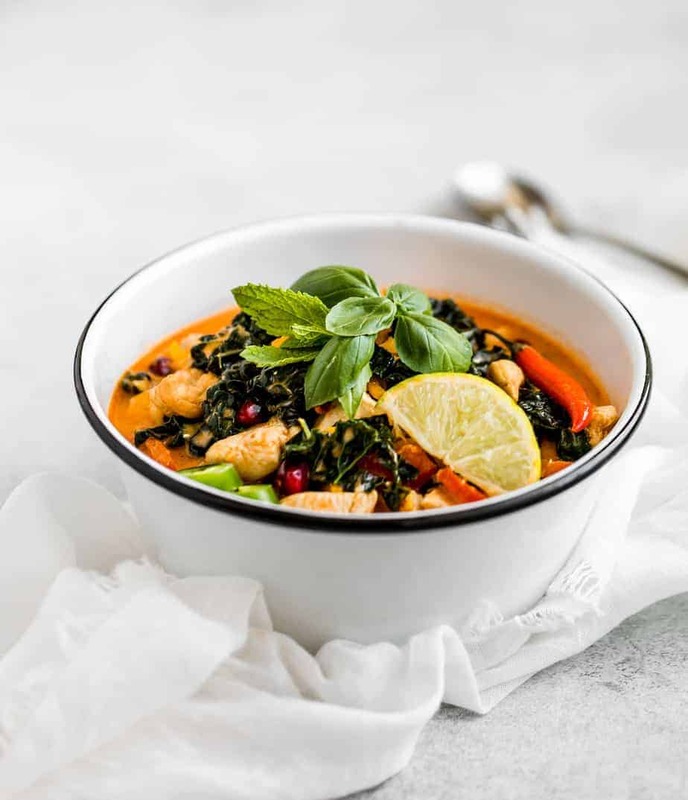 Today, I am going to share one of my favorite easy fall recipes: Thai Red Curry Chicken with Fall Vegetables . This Red Curry Chicken recipe is easy to prepare, has substantial textures and some intense flavors! I cooked this Thai Red Curry Chicken using Crisco® Unrefined Coconut Oil. 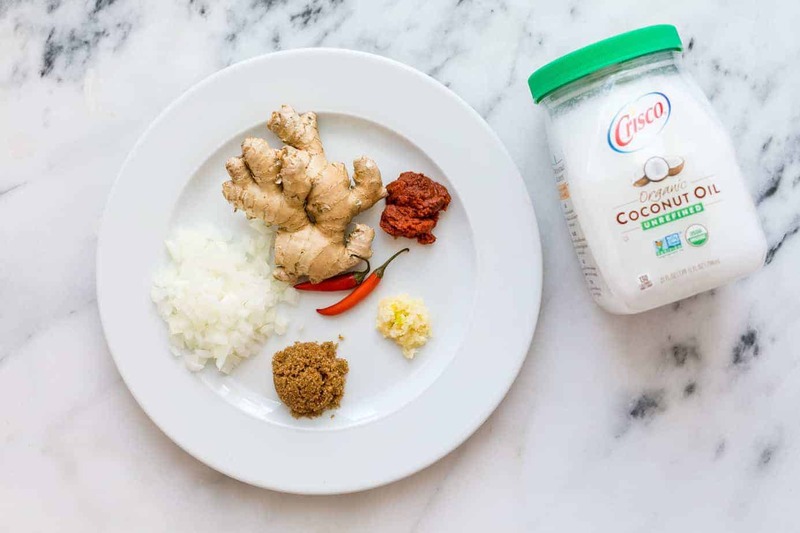 This is the least processed form of coconut oil, so it retains the distinct coconut flavor and odor, makes it perfect for any comfort food recipe, or for recipes where a coconut flavor is desired like in a curry dish, stew, baking or sautéing veggies. Over the last week I also tried it with a shrimp dish and a pork dish and thought the light coconut taste blended absolutely brilliantly with those two proteins. For recipes where coconut flavor is less desired, try Crisco® Refined Coconut Oil. You can add this oil to your recipes without the coconut flavor or aroma, yet get all of those coconut oil benefits. On that note, both are gluten free, USDA Organic and Non-GMO Certified… three things that I’m happy to see in any product. It took me a while to try out coconut oil for the first time, but once I did I never looked back. Crisco® Coconut Oil is a great organic substitute for butter, margarine, or other oils. Crisco® Refined and Unrefined Organic Coconut Oil is available at Target for this recipe, or any of your fall recipe needs. Don’t forget to use a cartwheel coupon offer for 25% off all Crisco® Coconut Oil varities to save on your next purchase! This offer is only valid from September 3rd to October 7th. In a large skillet or dutch oven, heat 2 tablespoons Crisco® Unrefined Organic Coconut Oil over medium heat. Once hot, add the chicken cubes and cook until browned (for about 7 minutes). Remove the chicken from the heat and transfer on a plate. Add 1 1/2 tablespoons Unrefined Organic Coconut Oil to the same skillet or dutch oven, then add white onion, garlic, and ginger. Cook until fragrant for about 1-2 minutes. Add Thai red curry paste, keep stirring for about 1 minute. Add chopped red bell peppers, cook until tender for about 3 minutes. Add the chicken back to the skillet and add the coconut oil, soy sauce, brown sugar, salt, and stir for about 15 seconds. Add chopped kale lacinato, reduce heat to low-medium, bring to a simmer for about 3-5 minutes, stirring occasionally. Optional: add 2 teaspoons fresh lime juice for more acidity or brown sugar for extra sweetness. This looks absolutely fantastic!! Autumn is my favourite season as I just love all the colours and flavours; can’t wait to try this out, love that it’s so easy to make as well! 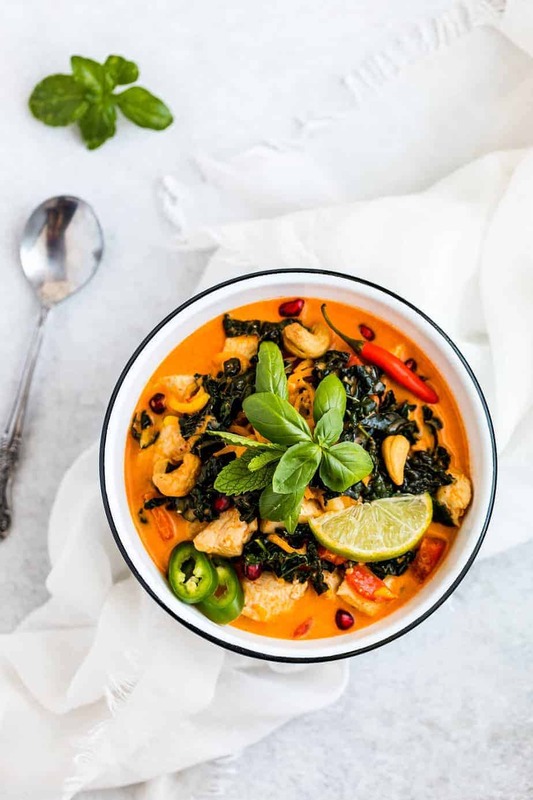 I’ve never thought to add something like kale to a red curry before but I love the idea. It somehow makes this already amazing dish look even better. Oh wow! I’ve been having so much curry lately and love that this dish has all of the delicious flavor and is packed with veggies! Sounds right up my alley! Yum! What a delightful curry – so hearty and texture filled – perfect for these cooler evenings! It looks really vibrant! I think homemade curries make such comforting meals and it’s a lovely idea to add the kale too.